Is “Fake News” Scare Being Used to Stifle Dissent? Tveten, who covers the intersection of the technology industry and socioeconomic issues, just wrote the piece “How the ‘Fake News’ Scare Is Marginalizing the Left” for In These Times magazine. Tveten writes: “In the wake of the 2016 election, pundits pointed their fingers at Facebook, Google and Twitter, accusing them of spreading misinformation about political issues and figures to the U.S. voting citizenry. 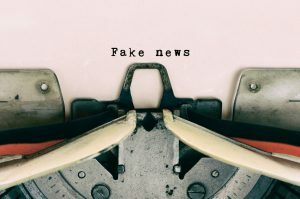 A circuitous, concern-trolling tactic, the Fake News scare soon gained momentum among corporate media outlets and politicians seeking to find palatable scapegoats for the stunning election of Donald Trump. “When the pressure grew too high to ignore the calls for Fake News containment, the Internet giants took action. Google began to stymie ads it deemed dubious. Facebook floated features to flag Fake News and tweaked its ad policy. Months later, Twitter joined the chorus, essentially echoing Facebook’s approach. “The U.S. public has never quite learned the criteria of Fake News, nor has it received a coherent, conclusive explanation of exactly what Russia did. The U.S. public has, however, been given a crash course in corporate, centrist boosterism. Anxieties over the roles of Facebook, Google and Twitter in disseminating of Russian-engineered Fake News have merely posited the corporate state’s centrism as gospel and antagonized the Left in increasingly sophisticated ways. Furthermore, the proposed technocratic solution of relying on these unaccountable megacompanies to determine what information they broadcast will only exacerbate the problem.